The Amigo Walker 200g blanket has a specially cut model that is suitable to wear during movement. The outer fabric is made of waterproof and breathable polyester. The inner lining is made of smooth polyester. This cut-out model is made so that no abrasions occur on the shoulders during movement of the horse. 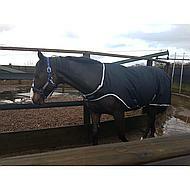 The blanket has a lightweight 200g lining to keep the muscles warm. The blanket closes at the front with a hook / eye closure, has surcingles under the belly and a leg strap. Neat blanket with good fit. Easy to do. Does not sand. closes high. Beautiful blanket easy to clean, and the inner lining is made of smooth polyester so it does not rub so much on a shaved horse's coat! The blanket has a great quality and sits great.